Physicians and medical students often do not attend to their own health, failing to recognize depression in themselves or in their colleagues. 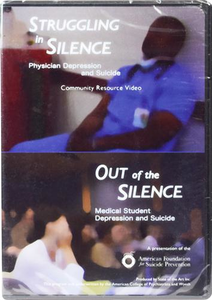 This 2 DVD set includes: “Struggling in Silence: Physician Depression and Suicide Community,” a 17-minute video featuring interviews with doctors and a medical student speaking candidly about their battles with depression, and medical experts discussing the policies and stigma that prevent physicians from seeking help for this treatable illness. Also included is the 15-minute video “Out of the Silence: Medical Student Depression and Suicide,” which shares the story of one medical student’s journey through the symptoms, diagnosis and treatment of a mood disorder, and a school’s effort to combat the problem of suicide among the nation’s next generation of physicians. The Struggling in Silence/Out of the Silence – DVD also contains a printable resource guide and slide set for both films.